Mikey is clearing out his thread yarns. Would you like some free yarn? I am clearing out my Thread Yarn that is in my yarn collection. I struggle with thin yarn like this as the hooks required are thin and I have a slight shake in my hand to manage it effectively. So I am giving my yarn away. My yarn is random brands and textures. 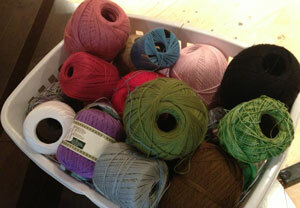 I will be dividing my laundry basket into 4 groups of thread yarn. It will be random to the winners who receive this. Simply put, you cannot pick the yarn you prefer in your giveaway package. If you would like this yarn, please submit me an email at MikeysHelpDesk@hotmail.com. To qualify, the Subject line must read THREAD YARN GIVEAWAY, please leave me your name and address. Only enter 1 time, multiple entries from the same person will void all of the entries from that person. Four people will be randomly selected to receive my yarn gifts. I cannot bring myself to throw out good yarn, so I prefer to send it to someone that would like it. I will cover the shipping costs associated with each of the 4 giveaways. Giveaway Entry will end on Friday, September 6, 2013 at 5pm Eastern Standard Time. This entry was posted in Crochet Challenges and tagged crochet crowd, Giveaway, Mikey, Stash, Thread Yarn, Yarn. Bookmark the permalink. I sent my name and address with the subject listed as stated but when I checked to see that my email had been sent it said that there was no subject I hope it will be okay. Thanks Mike. I took out all the caps and it went through. I get a message like Terry above that says MikeysHelpDesk@hotmail.com. is an invalid email. I copied from above. I would love to enter. What should I do? For some reason the email sent before I had a chance to put in my address. I got my name, but not the address. I sent another one right after with the address – just wanted to let you know that I wasn’t trying to do multiple entries, just one with the correct information! I hope that’s okay and thank you so much for the giveaway! Thank you for sharing, Mikey! In my area, not a lot of crocheters do thread work, but I am one of them. I made a pineapple tablecloth for my mother-in-law for Christmas one year, and crocheted thread carnations (they look so real!) for Mother’s Day another year. She loves them! I can never seem to find a good variety of sizes and colors, so the random thread would be most welcome! Saw your post about all the incorrect entries. So sorry that so many cannot follow instructions when you are so generous to do this. very generous thing to do, thank you for thinking of sharing, I crochet and knit and do all kinds of crafts, and I share my supplies with others close to home when I think I have something that they need, would love to win…thanks again. RebeccaK. You’ve been so helpful! I love your videos, and the “bloopers” always make me smile. My old eyes are challenged by the tiny thread and hooks, but my hands remember the movements! Reading the pattern? Always got lost in that, lol. Thanks for all you do! Good luck to you! Thank-you Mikey for sharing. Hope you are having a great day! Is this this open to everyone or just your followers in the US? Yep… if it wasn’t I would have stated so. It’s open to anyone worldwide. The draw is random. Thanks Mikey, for the Thread giveaway drawing. I just entered the drawing. What an inspiration! This is a great idea! Aside from not throwing away, it gives someone an opportunity to try something new if they haven’t worked with this type of threads/yarn in the past. Love it! You so rock! I love how you love your fans so much! Thanks for the chance to enter..I am a big fan of yours, and I lovw learning from you. Really great idea! !this thread works well for needle tatting as well as crochet doilies. Thank you from all of us that only use thread yarn. I love using crochet thread…doilies, and bedspreads, etc are some of my favorite things to make. You are awesome Mikey love the Crochet Crowd and all that you and Diva Dan do..blessings. My problem on the give aways or such that you do is that I can’t remember if I already sent the email or not. 🙂 This is the 2nd one that I wonder if I sent the email and don’t want to send one now in case I did and all will be void. Can’t you just void the 2nd one? I understand that shouldn’t be more than one and have no problem with that at all. Love your site and especially the free patterns. Thanks Mikey! I think I just did the same thing….ahhh baby brain …. Do you not have a “Sent” mail folder? You can always check there for what you have sent. Sometimes I have to check mine as I forget if I have mailed a particular friend when mailing to several. 🙂 Good luck! Thanks for the chance! …and sharing with us your wonderful talent! Your awesome Mikey!! Thanks for the chance!! I never win anything in my life, but here it goes. Thank you Mikey. You are so sweet!!! AWESOME! Thank you for your generosity. mikeyshelpdesk@hotmail.com … Please try again. It keeps all entries in the same folder for the random draw. Thanks for giving away the thread yarn. I’m making an afghan out of thread yarn and it takes a lot. After seeing your post, I sent an email in because I wasn’t sure if I had entered this correctly. And didn’t want to take the chance. I hope I don’t have to entries. Thanks for the chance Mikey.